New RoyalSlider for WordPress is responsive image gallery and HTML content slider plugin with touch-swipe navigation. Plugin is mobile-friendly and allows creating completely custom slideshows and css3 banner rotators with images, videos or HTML content in slides. You can also dynamically populate data from Flickr, 500px, or featured posts of any post type – like WooCommerce products. Developed in best pracises of CSS3 and HTML5. For photo gallery you can enable vertical or horizontal thumbnails, enable lazy-loading or fullscreen. Carousel also supports YouTube or Vimeo videos that allows you to create video galleries. RoyalSlider is focused on performance, stability and providing best experience for user with any device. It doesn’t have thousands of fancy transitions, but the one that he has work as fast and as smooth as current day technology allows. RoyalSlider for WordPress is created based on HTML version, selling here on CodeCanyon with over 8000 happy buyers and five star rating. All features from HTML version are available in WordPress plugin. RoyalSlider is tested on Mac, PC, iPad 2, iPhone 4, HTC Desire, Lumia 920, Surface, Blackberry PlayBook and even on Kindle Keyboard . If you’ve found that something works incorrectly on your device, so please contact me through my profile page. Sliders are automatically cached and will not slow down your website. There is an option to override default WordPress in-post gallery. Animated blocks editor that allows adding reponsive blocks — add blocks-captions to each slide and edit their content inline. Please note that this is not main RoyalSlider purpose and I recommend minimizing animation as much as possible to provide best experience for users on mobile devices. All slider designs are copyrighted by their authors. 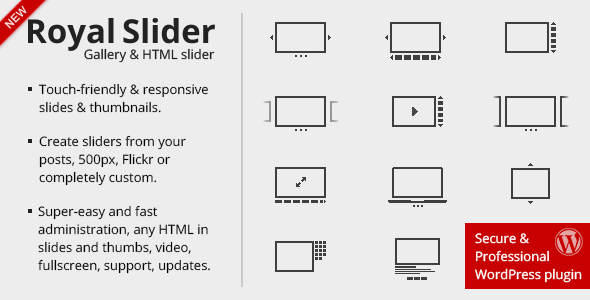 List includes sliders created both by HTML and WordPress version of RoyalSlider. Share the post "RoyalSlider Touch Content Slider for WordPress"